Create an inspiration board. Pick images that will motivate you on those cold days when you don’t want to get out of bed. Maybe it’s a picture of that gorgeous Lakefront Trail in the summer, or the beach vacation you are taking in the summer, or an image of a basket of beautiful, fresh fruits and vegetables. Whatever images motivate you and inspire you- surround yourself with them. Put the board on your bedroom mirror or on your bathroom wall so you will see it first thing in the morning. Better yet, snap a picture of it and make it the screen saver on your phone so you see it every time you look at it. Buddy up. You are much more accountable when you have a friend joining you- so find a buddy! Workout together at home, or go try a new class together- just get moving. If healthy eating is your goal, set a prep date with your buddy and assemble some freezer meals to get you through the busy weekday nights. Need some ideas, check out my Pinterest board. Healthy Food Can Be Comforting Too. Don’t get me wrong, I want to hunker down with a bowl of mac and cheese just as much as the next gal when it’s so cold out- but I know that it will leave me feeling gross and even more sluggish. Do a little searching for some healthy remakes of your favorite comfort foods- here’s a start. Exercise: Know what works for you. Ask yourself the honest question- what works for me? Do I need a trainer or group class outside of my house to get me motivated? Or am I a workout at home kind of person? I personally know that I will NEVER workout at home. I will come up with a million excuses to stop me- the dishes, the laundry, Facebook…I could go on. So, I have to leave my house to workout But many people find working out at home to be the only way they can get it done. Ask yourself the question, and then do it. Reward yourself! Set a goal for yourself and reward yourself when you get there. Maybe it is a new pair of workout pants when you have worked out 5 days a week for a month. Or maybe it’s setting a goal of not ordering take out during the week and rewarding yourself with a meal out on Saturday night. Make steps every day towards your goal and reward yourself when you get there! What helps you stay motivated when it's far easier to go into hibernation mode? Share it with us below in comment. Need some workout motivation of your own? 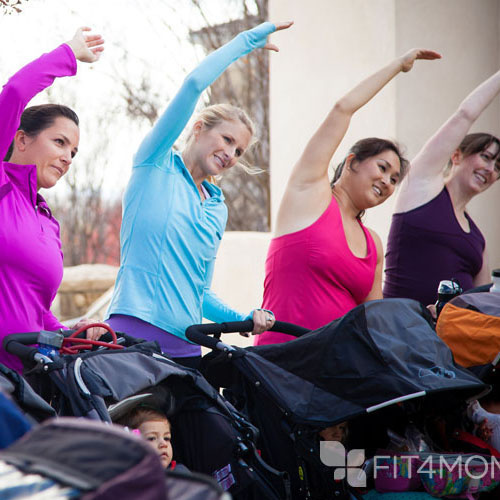 Join Fit4Mom Chicago for a new session of Stroller Barre at the Drucker Center in Lincoln Park. Stroller Barre is a class format from FIT4MOM/Stroller Strides which incorporates movements from pilates, ballet and barre methods to provide a unique and effective workout designed specifically for the pre and postnatal mom. Stroller Barre uses tubing, the stroller and the environment to provide an all over toning and fat burning experience. Everything that you love about Stroller Strides- the parent/child interaction, the cardio and strength training combination, individualized attention- are present in Stroller Barre. The 8-week session meets Tuesdays and Thursdays at 11:00 am from 3/3/15-4/23/15. All NPN members get a $20 discount on the session. Want to try Stroller Barre first? Join us for a preview class February 24th or 26th at 11:00 am. Email jackied@fit4mom.com with any questions.